On April 11, two consecutive earthquakes with magnitudes of 8.2 and 8.6 occurred off the west coast of northern Sumatra, where the Sunda plate meets the Indi/Australian plate. 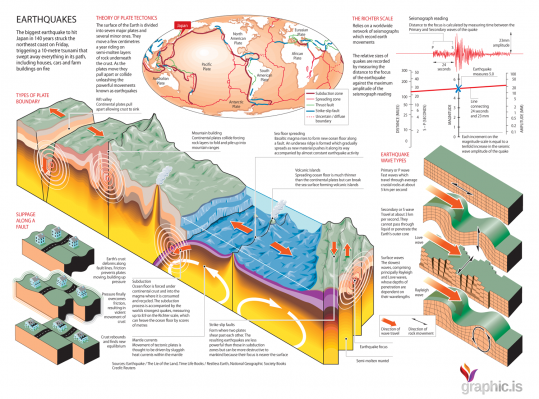 Many earthquakes happen at these ‘plate boundaries’ due to movement of the plates themselves. This specific plate boundary is in the same location of the record 9.1 earthquake from December 26, 2004 that caused multiple tsunamis, killing over 230,000 people. Tsunamis occur when an earthquake creates a shift in a huge amount of landmass under the ocean. When this large amount of land moves under the water, an upswelling occurs, creating the tsunami wave. A tsunami did result from the April earthquakes, but people living in the surrounding areas were prepared and no one was hurt. Unlike recent years, no tsunami was able to cause enough destruction to be considered a disaster! Like earthquakes, most volcanoes are located near plate boundaries. The volcano that affected the most people in 2012 is Volcan de Fuego. It is located in Guatemala on the ‘Ring of Fire’. The Ring of Fire surrounds the Pacific Ocean and is made up of volcanoes. A few different plate boundaries come into play along the ring, but the result is the same: hundreds of volcanoes. When Volcan de Fuego erupted on September 13, 2012, the Guatemalan government called for the evacuation of almost 35,000 residents in 17 surrounding areas. Other significant eruptions of 2012 were the Plosky Tolbachik in Russia, Puyehue in Chile, and Etna in Italy. Japan is a series of islands formed by volcanoes located on the Ring of Fire. Along with a healthy dose of volcanic activity, Japan experienced massive floods and landslides in 2012. In early July 2012, southern Japan experienced torrential rainfall exceeding 3.5in per hour, resulting in flash floods and at least 518 landslides across the country. Twenty-eight people were confirmed dead and over 250,000 people were ordered to evacuate. Landslides can be especially deadly due to the speed at which they can travel, sometimes up to 35 mph. They are made up of anything that gets in the way, creating an almost solid wall of debris. Landslides are oftentimes associated with floods because they are caused by the buildup of large amounts of water on a mountain slope or hillside. All the geologic hazards discussed happen daily around the world. However, under the right conditions, they turn deadly very fast. It is always important to know what hazards are common in your area, and be prepared for all possibilities. A 7.4 magnitude quake struck offshore of El Salvador tonight (Sunday). The USGS reports the quake hit at 10:37 pm at the epicenter in the Pacific Ocean about 105 miles south of San Salvador, El Salvador, and 74 miles south of Usulutan, El Salvador. The depth was recorded at 52.9 km (32.9 miles). A tsunami warning is in effect for Costa Rica, Nicaragua, El Salvador, Honduras, Guatemala, Panama and Mexico. A tsunami warning has not been issued for Hawaii. Missouri, Kansas and Nebraska were slammed by deadly storms around 1 a.m. today. Massive damage, injuries and fatalities have been reported in Branson, Mo; Buffalo, Mo; Harveyville, Kansas; and Harrisburg, Illinois. Small towns in Illinois and Kansas were hit hard. At least nine deaths are blamed on the tornadoes. The Christian Science Monitor quoted Branson’s Mayor “We were blessed with several things—the time of year and certainly the time of day, when people were not in their vehicles or outdoors,” said Mayor Raeanne Presley, noting that during Branson’s peak season, up to 60,000 visitors would have been in the city on any given day and staying in many of the hotels that were damaged. Tulsa World News posted a historic record of previous Leap Day tornado outbreaks. The growing reports indicate that 2012 may be the worst Leap Day outbreak yet.